Naturally everyone was worried. Plastic bags were to be banned on Oahu beginning July 1, 2015 and plastic bags could be found everywhere. How were people going to manage a life without plastic bags? Probably like how the other islands had done it. 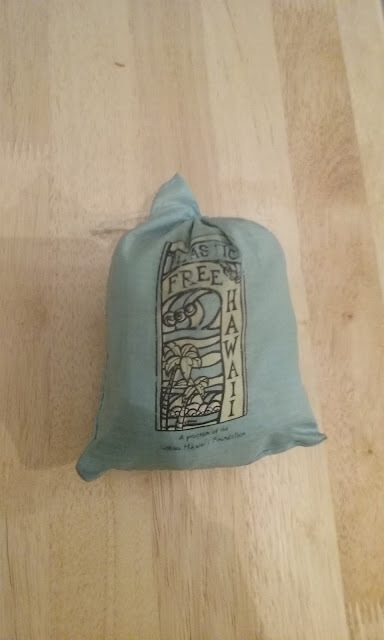 About a year before the plastic bag ban was set to go into effect I stumbled across a group called Plastic Free Hawaii. They had a booth set up outside of the local Whole Foods talking about the dangers of plastic bags. They also were handing out reusable plastic bags, for free, for those who signed the pledge not to use plastic bags. 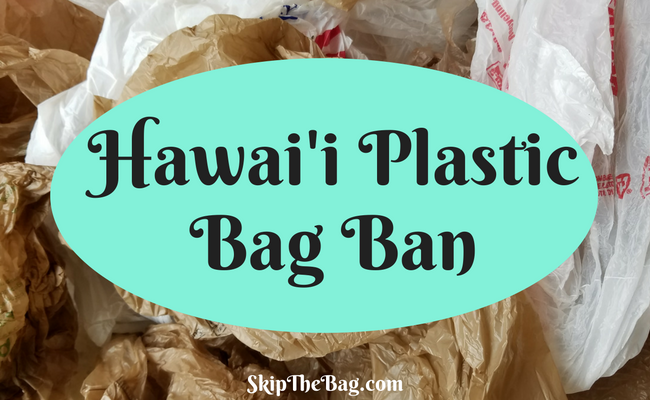 So I threw it in my purse and when I was in a grocery store I would use that instead of some or all of the plastic bags I would normally get. The bag was also washable, so if something spilled in it I could either wipe it down or just throw it in the laundry. The bag held up with pretty rigorous use for nearly a year when some of the stitching started to come out and I upgraded to another bag. The ability to carry the bag in my purse was huge in my ability to actually use the bag. I just always kept it in there for when it was needed. When the bag ban started, there was really little that changed for us because we’d been using our reusable bags so much. A new Target store was built in Kailua shortly before the ban was to be in place and they simply never carried plastic bags. It was simpler to do that than start with plastic and swap over a month or two later. So how did life change when the bag ban went into effect? Not by much. We were already in the habit of bringing our own bags. Besides, the law is actually pretty narrow in its coverage. 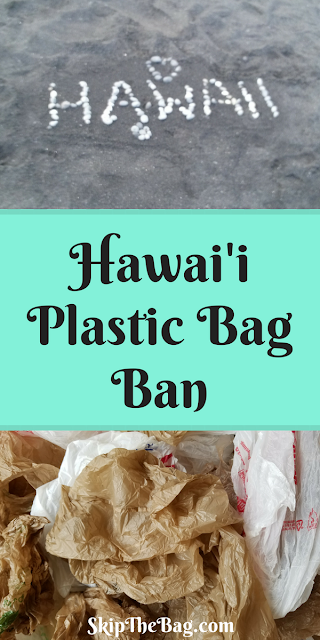 The ban only applies to single-use plastic checkout bags. What you normally thing of as the plastic bag when you go to a grocery store. However there are a whole list of bags that are still allowed, including those you would find at a grocery store. They include the bags you use for fruit and meat found in the produce or butcher areas, but also the bags you find in the floral department or get from the pharmacy. Laundry or dry cleaning bags and bags from restaurants or take-out establishments were still allowed. There was still a plethora of plastic to be found, just not at the register of a grocery store. Furthermore the law states that checkout bags must be one of 3 things: recyclable paper, compostable. or reusable. Sounds great, right? Paper bags that are 100% recyclable are generally made from at least 40% recycled materials. Compostable means that they can biodegradable, albeit possibly only in commercial composting facilities. That leaves reusable bags, like the one I had. Well there is a small caveat in this part of the law. Reusable was defined as a bag made of cloth, washable fabric, or other durable material including plastic that is 2.25 mil thick. So there were a few companies that still handed out plastic bags…they just handed out thicker bags (fail!). However in general companies went with paper bags and many more patrons were bringing their own. Would you be worried to hear a plastic bag ban is coming to where you live? 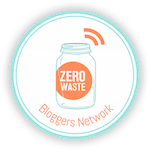 Have you taken the #SkipTheBag challenge? If you live in an area with a bag ban have you progressed to Level 2 or 3 of #SkipTheBag? *This post contains affiliate links. Please see my disclosures and privacy statement. It can seem intimidating at first, but it's really not hard. People lived for a long time without plastic bags! There is at least one city in Oregon that has a plastic bag ban. I wouldn't mind, but they started charging for paper bags! I have several cloth bags and even several produce bags, but often forget to take them in with me, and then they ask if I want a bag, and ...you guessed it, I have to carry an armful of items out by hand! This isn't just for grocery stores, it is for ALL stores! Since it is only one city and there are others close by, I tend to forget when shopping and find myself in the plastic ban city. I DO hate plastic bags, and really wish they had never been invented, but feel that charging for the paper is unfair since they didn't charge for them before the ban. I'm so glad that Oregon is on the movement! It's hard when they include paper bags in bans and fees, but they too have their environmental impact. I found that since I've got a bag that folds in my purse I am more likely to have it with me. I wouldn't mind the ban as I have several bags I take to the farmer's market and Aldi supermarket. They don't fit in my little purse but sometimes I just keep one in the car. I can't tell you the number of times I would run out to the car to grab my bag while we were waiting in the grocery store line!